I want to help y’all, so I made a picture of it for you. Strategy graphic no border — click on this and see it at any size that works for you. Here is the same thing as a jpeg. Just do one thing — figure out where Strategy fits and why it is so important to know. 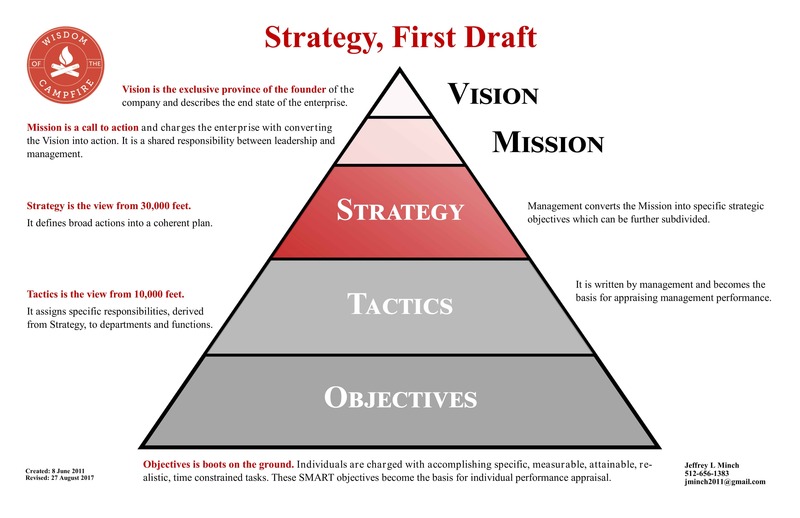 Now, let’s get you started writing your First Draft of Strategy. But, hey, what the Hell do I really know anyway? I’m just a Big Red Car. Happy Labor Day, y’all! God bless Houston. God bless Texas. God bless you. You can’t write the First Draft of your Strategy if you don’t get where it fits into things. Here it is.